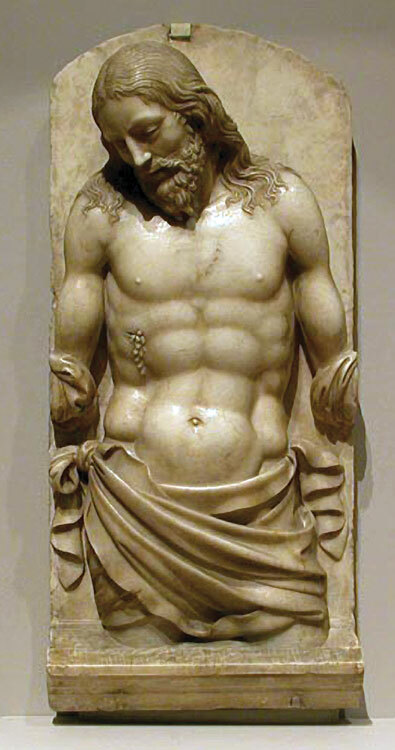 Instead of waiting to be devoured, the young men are in postures of humility and adoration. 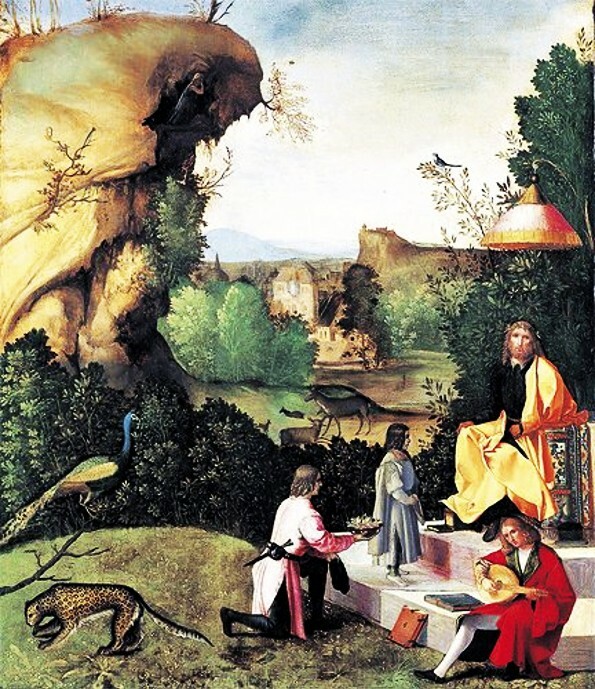 I cannot identify all the iconographical elements in the painting but the peacock is usually a sign of incorruptibility or immortality, and the leopard a sign of sin. In the Giorgionesque rocky outcrop someone appears to be kneeling in contemplation. A few years ago, my wife and I visited MOBIA, the now defunct Museum of Biblical Art in New York City, to view an exhibition entitled, “Passion in Venice, Crivelli to Tintoretto and Veronese." 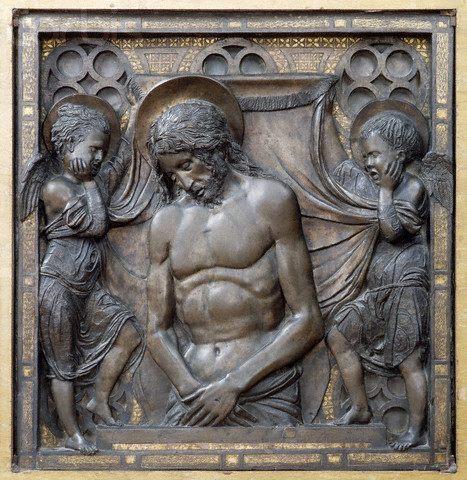 The title of the exhibition was a little misleading since it was given over almost entirely to images of the suffering Christ or "Man of Sorrows." a popular subject in the fifteenth and sixteenth centuries. 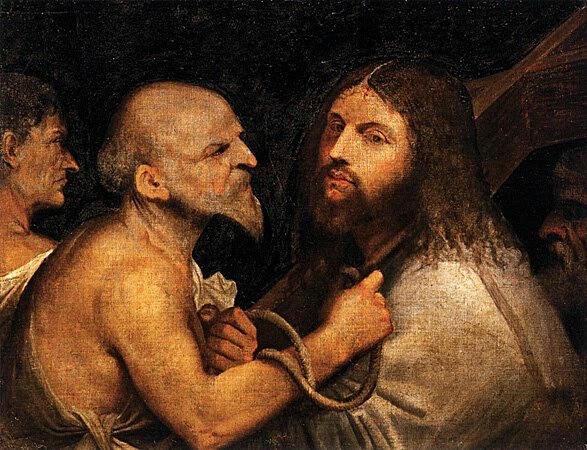 In addition to the "Saturn Exiled" that Dr. Dal Pozzolo placed at the very beginning of Giorgione's career, the famous “Christ Carrying the Cross” could also be a depiction of the "Man of Sorrows." Vasari claimed that this painting had miraculous healing powers from the time it was first unveiled in the Scuola di San Rocco. Vasari originally claimed that Giorgione did the painting, but in his second edition he gave it to Titian. Since that time scholars have not been able to resolve the question of attribution. A thing despised and rejected by men, a man of sorrows and familiar with suffering… And yet ours were the sufferings he bore, Ours the sufferings he carried… Yet he was pierced through for our faults, Crushed for our sins. On him lies a punishment that brings us peace, And through his wounds we were healed. *Enrico Maria dal Pozzolo, Giorgione, Milan, 2009. Giorgione catalogs by Anderson (1997), and Eller (2007) do not agree with dal Pozzolo's attribution. They accept the title "Homage to a Poet", but without much discussion. **Edit. 11/2/2013. Please notice the baldachino above the head of the Man in Giorgione's painting. It looks somewhat like an ornate lampshade. In an exchange with David Orme, an English friend and lover of Venice, he told me that he had seen similar fixtures still existing in Venice. Below is an image supplied by his friend, Albert Hickson.